Forum of Federations, Fundacion Gimenez Abad, International IDEA and The Center for Constitutional Transitions are proud to present the 7th Occasional Paper which delves into Indonesia’s unique situation. Indonesian politics have been characterised by a large number of territorial cleavages that have only been partially addressed since the beginning of democratisation in 1998. It is a very diverse country with a history of several challenges to the state’s external boundaries, as well as internal ethnic and religious conflict. A strong anti-colonial nationalist movement constructed a core set of symbols and ideas around which the nation and state of Indonesia were eventually created, including Bahasa Indonesia as the national language. During three decades of authoritarian rule, the state primarily emphasised unity and national integrity over accommodating its diversity. 2Repression was routinely used to quell rising grievances. When the regime began to democratise in 1998, several groups mobilised and demanded more autonomous powers and resources. Most groups primarily grumbled over strong state centralisation. Acehnese, Papuans and East Timorese, however, developed sub-state nationalist movements, all of which demanded independence in response to deeply seated grievances. Decades of violent repression, human rights abuses at the hands of the armed forces, displacement and marginalisation fed strong resentment against the Indonesian state. A ‘constitutional transition’ began with the fall of President Suharto’s authoritarian regime in May 1998 and ended with the adoption of the Law on Aceh in 2006. In the first instance, Indonesia’s highest governing body, the People’s Consultative Assembly (Majelis Permusyawarahtan Rakyat, MPR) adopted several constitutional amendments between 1998 and 2002. While preserving the 1945 Constitution, which had formalised a strong centralist and authoritarian regime, the MPR nevertheless radically transformed its substance to support democratic change. Among its notable features, it enshrined principles of “wide-ranging autonomy” for Indonesia’s diverse regions (Art. 18, sec. 2 and 5) and mandated the adoption of legislation that recognised the “particularities and diversity of each region (Art. 18A, sec. 1). Legislation that addressed these issues includes two iterations of fiscal and administrative decentralisation laws that applied to all regions of Indonesia, in 1999 and 2004. 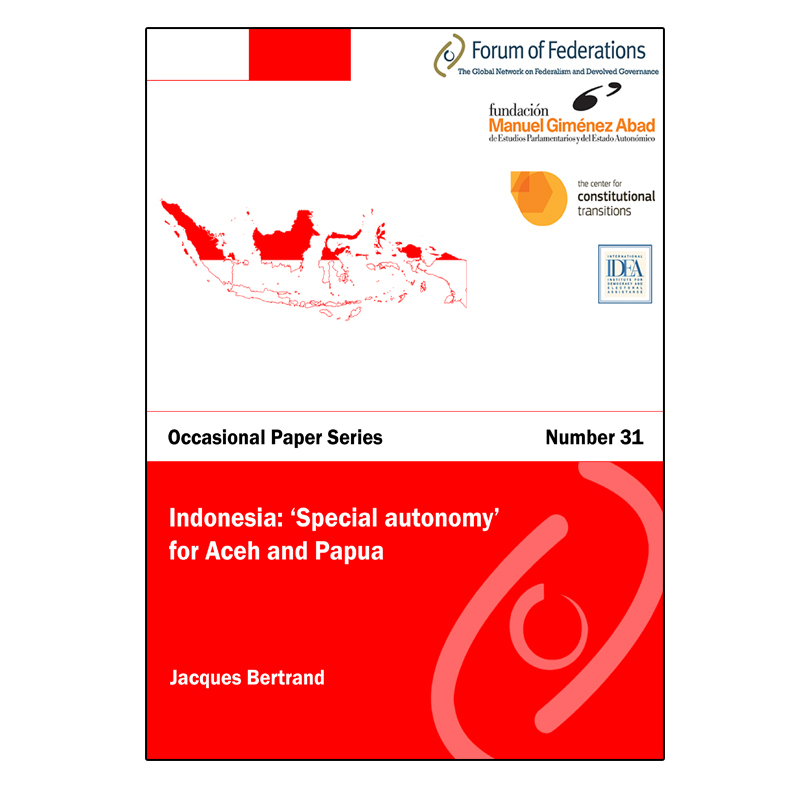 The state adopted two special autonomy laws in 2001 to address grievances in Aceh and Papua. While the special autonomy law still governs Papua, it no longer applies to Aceh. Instead, new legislation ensures broad autonomy powers and highly favourable fiscal concessions under the 2006 Law on Aceh. East Timor obtained a referendum on independence in 1999 and seceded from Indonesia. government. As a result, low-level conflict continues to plague Papua and a more successful negotiated solution still elusive.